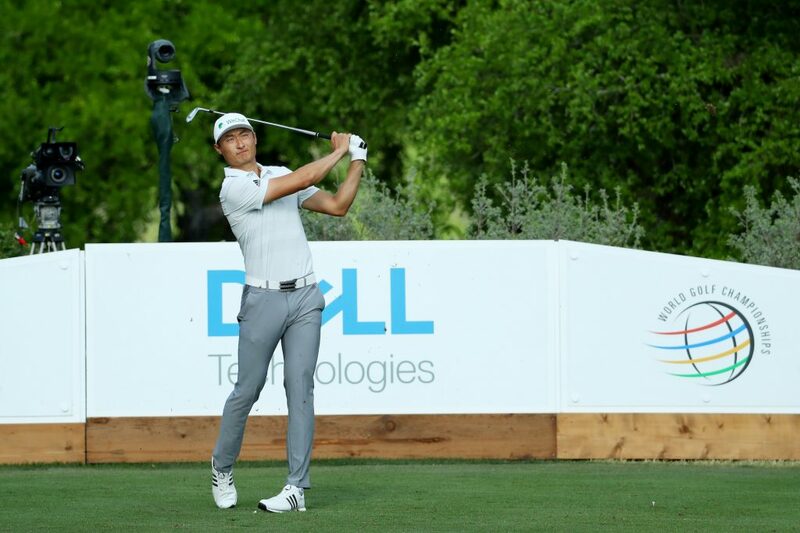 China’s Haotong Li admitted he got ‘lucky’ as he progressed into the Round of 16 after a nail-biting third round at the US$10.25 million World Golf Championships-Dell Technologies Match Play on Friday. The 23-year-old, who had beaten Alex Noren and Brooks Koepka in his first two Group 3 matches at Austin Country Club, suffered a narrow 1-up loss to England’s Tom Lewis after he agonizingly missed a nine-foot birdie putt on the 18th hole which would have secured a tie and a straight passage into the knockout phase. With Noren defeating Koepka for his second win in the group, it meant the Swede and Li headed into a sudden-death playoff which the young Chinese eventually prevailed with a three-foot birdie on the first extra hole to emerge as the lone Asian to advance into the weekend play. “The whole day was just like a roller coaster,” said a relieved Li. Shrugging off his defeat to Lewis, Li regrouped quickly. He split the fairway with a solid drive in the playoff hole against Noren, whom he had beaten 5 and 4 on Wednesday, and then fired a superb wedge approach shot to three feet of the pin to secure his place in the last 16 against last year’s runner-up Kevin Kisner, who edged out Ian Poulter in another play-off to advance. “I got lucky here (in the play-off) … honestly. I hit it a little thin and as soon as I saw that bounce, I was like, ‘God! Thanks’. I am so thankful for everything,” said Li, who lost his three group matches in his debut last year. With a knock-out Round of 16 match against Kisner on Saturday morning, the Chinese rising star, who is a two-time European Tour winner and Presidents Cup International Team hopeful, knows he must power-up again overnight to have a chance of extending his magical run at the WGC-Dell Technologies Match Play. “I felt like I ran out of all the energy already. I need to get something, recover and let’s see what we can do tomorrow. Hopefully, I can win a few more matches,” he said. Thailand’s Kiradech Aphibarnrat lost 2-up to Scotsman Russell Knox as his hopes of reprising last year’s run into the quarterfinal ended in the group stage. With Australian Marc Leishman, a four-time PGA TOUR winner, earning his third win of Group 6 against Bryson DeChambeau, Kiradech’s match was irrelevant eventually. “My short game is so bad. I can’t get up and down from any par-5s. It’s quite disappointing on the par-5s. No birdies and then I chipped into the water on 12 and make a seven to lose the hole. It’s was a turnaround. I didn’t have any confidence around the greens. I have a lot of work to do,” said the 29-year-old, the first Thai golfer to hold a PGA TOUR card. Korea’s Byeong Hun An secured his lone win of the week with a 6 and 5 triumph over American Kyle Stanley, as with Japan’s Hideki Matsuyama who beat World No. 1 Dustin Johnson 3 and 2 and Satoshi Kodaira who defeated Thorbjorn Olesen 3 and 1. Si Woo Kim of Korea lost his third straight match of the week, going down 6 and 4 to J.B. Holmes. The Round of 16 matches on Saturday, starting from 7,35am, will pit the following: Marc Leishman (Aus) vs Louis Oosthuizen (Rsa), Haotong Li (Chn) vs Kevin Kisner (USA), Francesco Molinari (Ita) vs Paul Casey (Eng), Kevin Na (USA) vs Justin Rose (Eng), Lucas Bjerregaard (Den) vs Henrik Stenson (Swe), Tiger Wood (USA) vs Rory McIlroy (NIR), Matt Kuchar (USA) vs Tyrrell Hatton (Eng), Brandon Grace (Rsa) vs Sergio Garcia (Esp). Subsequently, the quarterfinal matches will begin from 12.30pm local time.